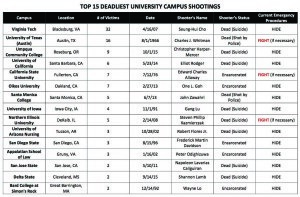 Home / Campus & Local / Other News / State / U.S. / Campus Shootings: Fight or Flight? Campus Shootings: Fight or Flight? Alejandra Arreguin, Misty Bollman-Browning, Chance Bragg, Dallas Burch, Tyler Christensen, Sara Gann, Rebekah Gilligan, Ariel Hall, Sean Hargrove, Dominique Martin, Veronica Morales, Aimee Nash and Cresenda Steele contributed to the reporting for this story. Of the 15 campuses where the deadliest shootings have taken place during the last 50 years, only three specifically encourage their students to “fight” should a gunman open fire during an active on-campus shooting. According to a review of emergency plans of the campuses involved, a majority of the campuses recommend the students to flee or take cover. Universities nationwide share common emergency procedures when it comes to the university’s safety: seek shelter and hide. Three universities, however, approach these situations in a more aggressive manner. The University of Texas at Austin, California State University and Northern Illinois University ask the faculty and student body to use physical force and aggression as a last resort. Like most higher education institutions, Tarleton State University has not been the target of an active shooter on campus. The university is, however, offering on request safety training – called CRASE, short for Civilian Response to Active Shooter Event. This training discusses the civilian response to an active shooter on a college campus by applying the ADD (“Avoid, Deny, Defend”) policy. Over the last 50 years, there have been 15 separate shootings on college campuses in which there were multiple casualties. All together, the shootings claimed 106 lives. 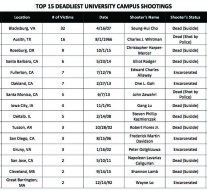 The most deady took place in 2007 at Virginia Tech University, where senior undergraduate student Seung-Hui Cho took 32 lives and wounded 17 others. Tarleton is also in the midst of writing rules governing how it will implement the “Campus Carry” law that goes into effect Aug. 1, 2016. The law allows people with Concealed Handgun Licenses to carry firearms on college campuses. According to Tarleton’s Risk Management website, the university is striving to create regulations that conform to the new law, support the university’s educational mission, protect the rights of citizens and ensure the safety and security of the entire campus. 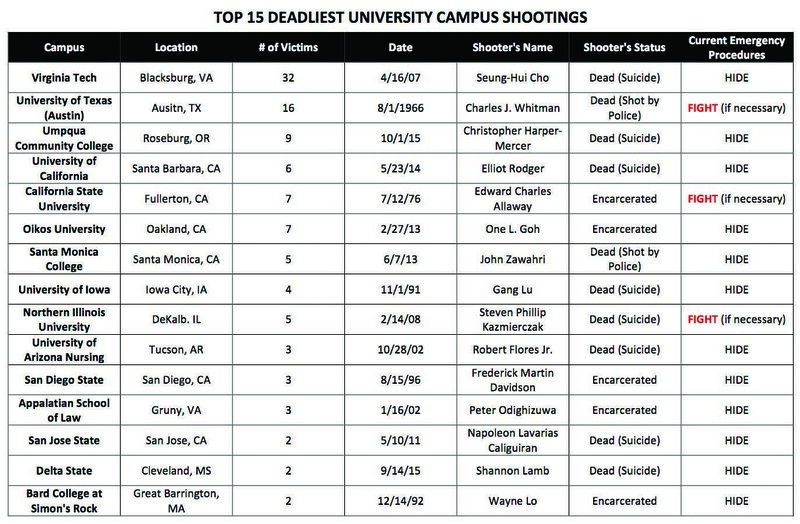 Many of the campus shootings have one common denominator: student shooters. Of the 15 shootings that have taken place in the last 50 years, eight of the shooters were enrolled at the respective university. In one case, the shooter was a professor. Jacobs said that Tarleton is also committed to the emotional well-being of students as well to their safety. The university provides a variety of interventional programs, such as CARE, Campus Assessment Response and Evaluation, allowing students to talk with trained counselors about their psychological health. Tarleton Police Chief Matt Welch says time is of the essence and how quickly the Tarleton community and its campus police department respond to a shooting is crucial. Welch says that past shootings have made the actions of law enforcement more efficient and timely so that they might prevent casualties or limit the number of victims.